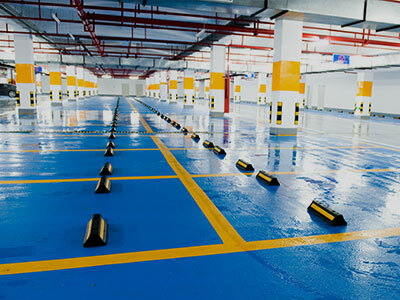 Parking Garage & Pedestrian Deck Flooring– typically, a parking garage may operate 24/7, with little opportunity for downtime whether making repairs and/or resurfacing the substrate. Under these circumstances, the polymer coating materials need to provide faster cures for quicker return to service. ProREZ offers flexible cure options even in lower temperatures with its epoxy, urethane, cementitious urethane, methyl methacrylate (MMA), and polyaspartic coating systems. ProREZ offers highly durable, hard-wearing & hardworking systems that can protect and enhance new structures as well as refurbish or restore existing surfaces, ramps, and decks- both intermediate & exposed. For joints, cracks, waterproofing, and noise attenuation, our elastomeric hybrids offer both flexibility and toughness. These high performance, seamless, non-porous coating & resurfacing systems are UV stable, with excellent tolerance for water ingress, fuel spills, chemical and salt exposures. They also provide excellent abrasion, impact, chemical, tire marking, and stain resistance. They’re easy to clean & maintain while balancing safety concerns with various non-skid textures and light-reflective finishes. Line striping, directional & safety markings can help establish pedestrian & traffic zones, as well as enhance the overall image of the parking facility. Pedestrian decks, stairwells, and service corridors provide important ingress and egress, to and from vehicles in the parking facility. 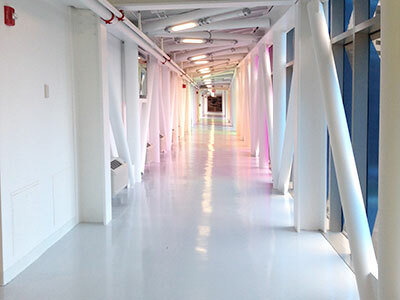 ProREZ offers both highly functional and decorative coating and resurfacing systems for these areas. They’re hard-wearing and long-lasting. These seamless and non-porous systems are highly moisture tolerant and waterproof providing excellent chemical, salt, stain, impact, and abrasion resistance. The finishes are UV stable, bright, light-reflective and welcoming, with a variety of colors, patterns, and textures to choose from. Directional & safety markings can be imbedded into the coating finish to help guide movement for pedestrian traffic, as well as enhance the overall image of the parking facility.